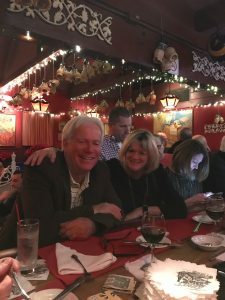 The last leg of our journey into La La Land was Dan Tana’s Italian Restaurant on Santa Monica Boulevard in West Hollywood, two doors down from the famous nightclub, the Troubadour. 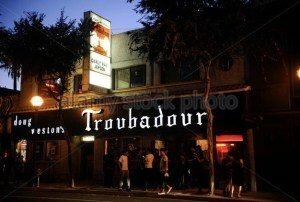 For those not familiar with the Troubadour, any musician who was anybody in the 60s, 70s and 80s performed there. In 1970 Neil Diamond introduced Elton John there, who performed his first show in the U.S. John Lennon and Harry Nilsson were ejected from the club for drunkenly heckling the Smothers Brothers. The list goes on. OK, back to Dan Tana’s. Every entertainer that you know has probably eaten there and many would call it their ‘go to’ restaurant. 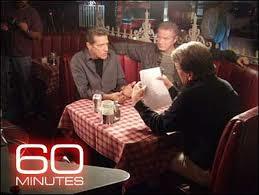 For the last 50 years it truly has been a favorite watering hole of Hollywood film industry personalities and professionals. The walls are adorned with pictures of various stars, past and present. In 1975 Glen Frey of the Eagles saw a young woman who he knew was married to an older man, having an intimate dinner with a younger man and started writing lyrics on a napkin – those lyrics turned into the Eagles hit, Lyin’ Eyes. I was hoping as we entered the restaurant that people wanting to have their picture taken with us would not pester us and ruin our evening. As it turned out, no one did. We arrived around 7:00 for our 8:00 reservation and the two small dining rooms, both of which are slightly larger than a walk-in closest, were about half full. The small bar had everyone of its 10 stools occupied. Within a few minutes Linda was able to wrangle a seat and soon a couple left, which gave us two much-coveted seats at the bar. The lady that Linda was sitting next to (whose lips had so much cologen in them that I thought they were going to explode any minute) had a seat on the other side of her that she was saving for her boyfriend, who was over at the Troubadour, checking in on a friend. She told us her boyfriend was in the “music business” (her quotes, not mine) and was talking with his friends, Hall & Oates who were performing there that night. A man down the bar, who looked like Fonzi’s father, we were told, was a famous ‘voice over’ performer. What I could pick up from his conversation was that his voice certainly was over, over-bearing. But overall a very good LA vibe to the place, meaning that there was a sense that everyone was looking at everyone else wondering if they were ‘someone’. A gentleman just down the bar asked me if I was Ray Bradbury, the science fiction writer. I said no and later when I look up an image of him online, I realized I should have punched the guy. At 8:00 the maître d came over and told us our table was ready, but the bartender, Raffi, was so entertaining that we said that we’d prefer to eat at the bar, which we did. We discovered a unique feature of the bar, your wine glass is never allowed to be empty. We each ordered a glass of cabernet (their ‘well’ cab is Francis Coppola) and whenever our wine glass got below half full, Raffi would stop buy and fill it up. I was afraid to ask how he kept track of how much wine we had and much more afraid to ask how much it was going to cost me. When we asked Raffi what was good on the menu, he said in a dry tone and a straight face, “Nothing, all the food here is bad and the service is worse.” But the entertainment was great! That’s why in the photo you see the fairly significant tip for Raffi – he was most appreciative. Linda and I ordered the Cannelloni and Veal Parmesan, respectively, both were outstanding, the service was great and the price of our multiple glasses of wine turned out to be surprisingly reasonable. When we left around 9:00 the place was totally packed with standing room only in every place one could stand. I’m sure some of them were ‘somebody’. It was a great experience! I have to say that while I’m not the biggest fan of L.A., it was a very entertaining day; and while we only saw a very small sampling of it, Johnny’s Eastside Market, Chinatown, Little Tokyo, The Grove, Rodeo Drive and Dan Tana’s, they all got me closer to believing that L.A. is, in fact, the ‘entertainment capital’ of the world. 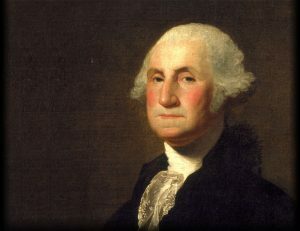 OUR FIRST PRESIDENT … WAS WHO?! My New Year’s resolution this year was to tune out the news. As a result, the satellite radio in my car now plays either music or comedy. So far I’ve been much happier and less depressed so I guess the old saying, “Ignorance is bliss” is true. But that’s a discussion for another time. Today, apropos to the holiday, I want to share something I learned while listening to the “60’s on 6” program on Sirius XM. The host asked who the first President of the United States was. You just know when they ask such an obvious question that the answer will come out of left field. Sure enough, a couple of minutes later a guy called in and said the answer was John Hanson. “Yep!”, cried the host. I just about drove off the road. I consider myself a pretty good student of history. I minored in it in college and to this day every other book I read is a history book of some sort. I’ve never even heard of this Hanson fellow. The whole thing sounded bogus to me. What about George? What about his chopping down the cherry tree and smiling with his wooden teeth? Was everything I learned in school wrong? I went in search of the answer. It turns out that there is a contingent who support the notion that Hanson was our first President. Conveniently, most of those people are his descendants. For what it’s worth, here’s a bit of history on him and after reading this you can form your own opinion. In 1661 John Hanson’s grandfather came to America as an indentured servant. Two generations later John was born in 1721 to what was by then a very wealthy and prominent family. Little is known about his early life but his career in public service began in 1750, when he was appointed sheriff of Charles County. He then served in the Maryland General Assembly for twelve years before moving to Frederick County where he held a variety of offices, including deputy surveyor, sheriff, and county treasurer. He was one busy guy and, if nothing else, may have been our first professional politician. 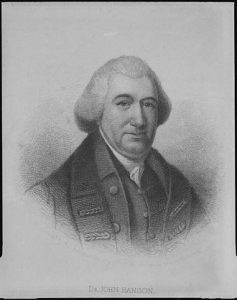 When relations between Great Britain and the colonies soured in 1774, Hanson became one of Frederick County’s leading Patriots. He was known for his organization skills in gathering supplies to use against the Tories and even paid the rag tag Revolutionary forces out of his own pocket. Think about that – do you see any of our current elected officials dipping into their own funds? So we have to assume he was a dedicated guy. In December 1779, the Revolutionary War victorious for the Patriots, the Maryland House of Delegates named Hanson to the Second Continental Congress; he began serving in Congress in Philadelphia in June 1780. On November 5, 1781, Congress elected Hanson as its president. And this is where the controversy begins. Under the Articles of Confederation, the United States had no executive branch; the president of Congress was a mostly ceremonial position. The office did require Hanson to serve as neutral discussion moderator, handle official correspondence, and sign documents which sounds to me like he was a high-priced arbitrator. Apparently Hanson didn’t think much of his duties either because he is said to have found the work tedious and considered resigning after just one week, citing his poor health and family responsibilities. I think that was the precursor to “resigning to pursue other opportunities” excuse. Out of a sense of duty Hanson remained in office, and though he obviously was trying to squirm out of the job, the Maryland Assembly reelected him as a delegate on November 28, 1781, and he continued to serve as president until November 4, 1782. He died 11 days later so maybe he really was sick. In 1898, Douglas H. Thomas, a descendant of Hanson, wrote a biography promoting Hanson as the first true President of the United States. Thomas became the driving force behind the selection of Hanson as one of the two people who would represent Maryland in the National Statuary Hall Collection in Washington, D.C. His statue was completed in 1903 and can still be seen today in the Senate connecting corridor. His selection as one of the two bronzes to represent Maryland has been controversial from the start, with many contemporary historians citing others who were more deserving. As recently as 2011, Maryland lawmakers have considered replacing Hanson’s statue in Statuary Hall with one of Harriet Tubman. In any event, the argument as to whether Hanson was the first President was further promulgated in a 1932 biography of Hanson by journalist Seymour Wemyss Smith. Again, historians dismissed Smith’s viewpoint because his research was less than stellar. The most compelling argument as to why we consider George Washington, not John Hanson, our first President is that Washington was the first to have true executive powers under the Constitution. That seems like a sensible argument to me. The one thing that became clear in my reading is that John Hanson’s reputation has been commemorated far more than most of his contemporaries, other than the Founding Fathers. In 1972, he was depicted on a 6-cent US postal card, which featured his name and portrait next to the word “Patriot”. In 1981, Hanson was featured on a 20-cent US postage stamp. 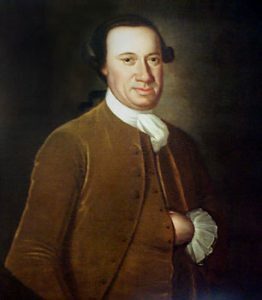 U.S. Route 50 between Washington D.C. and Annapolis is named the John Hanson Highway in his honor. There are also middle schools located in Oxon Hill, Maryland, and Waldorf, Maryland, named after him. A former savings bank named for him until it went under during the savings and loan crisis. And maybe that is the fitting end for his legacy given that most serious researchers consider his elevation to the “first President of the United States” to be based on an old hoax. Although it is currently ‘Awards Season’ (code for ‘Let’s pat ourselves on the back until everyone gets an award’ season) here in ‘Tinsel Town’, our trip was not to rub shoulders with the hypocritical privileged, but rather to explore some of the ethnic enclaves that thrive in the mega metropolis. First stop, Little Italy – I had Googled it and discovered that there really wasn’t much left of what used to be Little Italy, but the article went on to say that if you went to the Eastside Market, Italian Deli in that area that you might run into owner, Johnny Angiuli, who could tell you about the good old days when Little Italy was thriving. 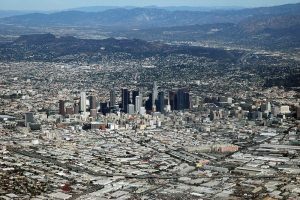 After less than an hour drive from our home, through downtown LA, we parked across the street from the deli and the minute we open the car door we could smell the great Italian aromas wafting through the store’s open front door . We walked in and wandered around looking at the nostalgic pictures on the wall. I approached the counter and asked a young man behind it if we were standing in what remains of Little Italy. He laughed and said, “Yeah this is about it, but when my father first came here it was a thriving Italian community.” I asked, “Is your father Johnny?” He said yes and pointed to an elderly gentleman sitting down in the corner of the store, then said, “I can bring him over here if you’d like.” I happily agreed. Johnny came over and introduced himself and welcomed us to the deli, then started telling us his story. He said he was born in a small Italian town a couple hours south of Naples called Adelphia and added that it was a great place for kids to grow up. 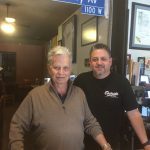 He came to America in 1959 and started working in the Eastside Market and ultimately became its owner. He said, “Times were very different then, Italians were very much discriminated against, it was even taboo for an Italian person to marry a white person, so we kind of stuck with ourselves here in this little community.” He was a most gracious man who got our exploration of LA off to a great start. Next stop, Chinatown – It was a short drive from the Eastside Market to the new Chinatown. Having been to Chinatown in San Francisco several times, we were expecting something like that, and in fact the old Chinatown was something like that, but due to ‘Tong’ warfare (fights between Chinese gangs), gambling houses and opium dens, the area decayed and was ultimately destroyed for the building of Union Station, LA’s railroad hub. So a new Chinatown was developed which was a little more spread out, but now a few blocks along Broadway could be considered the heart of the new Chinatown. We wandered the shops and found a great hole-in-the-wall restaurant to grab a very tasty Kung Pao Chicken and House Fried Rice lunch. 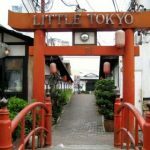 Next stop, Little Tokyo – Just across the freeway from Chinatown is Little Tokyo. In 1941 there were about 30,000 Japanese Americans living in Little Tokyo, but in December of that year, the Japanese were rounded up and incarcerated in internment camps. African Americans, Native Americans and Latinos moved in the area and took over their homes; because of their skin color the area became known as Bronzeville. After the war, many Japanese moved back and today Little Tokyo is thriving again. As we walked its streets, we felt bad that we had just eaten, as the smell of great Japanese food filled the air. After strolling through various passageways and poking into a few shops we headed back to our car for our next destination. Next stop, The Grove at Farmer’s Market – It was only about a 20-minute drive through some pretty rough parts of town and then through some very high end parts of town to what use to be orchards, a nursery and a dairy farm and is now one of the great outdoor shopping and dining areas in America – The Grove. 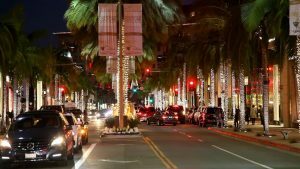 As it was now turning dark and cool we strolled down the center of the outside mall checking out the stores, restaurants, bars and the Farmer’s Market, which is still a part of this complex. We stopped and had a beer as we watched a band setting up for an open-air concert in February . . . that’s Southern California. 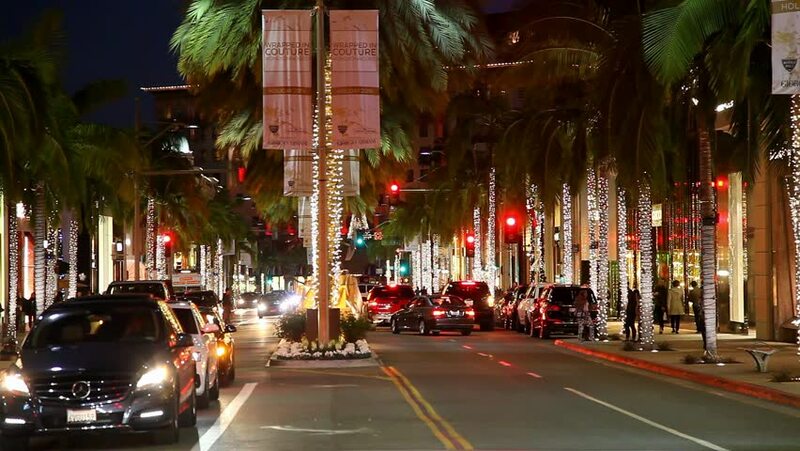 Next stop, Rodeo Drive – No tour of LA is complete without at least a drive down Rodeo (that’s Row-Day-Oh, not Road-E-O) Drive, where every high-end fashion company has a store. While Linda may have wanted to get out and window shop, I convinced her that we shouldn’t stop, we’ll miss our dinner reservation. Great stores, all lit up – keep going! 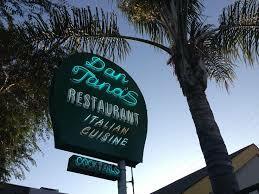 Next stop – Dan Tana’s Restaurant A classic LA eatery you’ll hear all about in two weeks. We actually did attend the event a few times and half the fun is observing the crowd. Normally golf galleries are filled with people wearing golf attire and sensible shoes. These are people who know the game and know what it’s like to walk around a golf course. At the Phoenix Open the crowd is filled with people either dressed in costume (Big Bird was popular this year) or barely dressed at all. There is fun to be had watching the young women who come expecting to prance around in their Louboutin heels but quickly discover that they are wearing the wrong kind of spikes. We’ve seen more than one novice ruin a $500 pair of shoes when she goes “heels down” in a combination of soft grass and spilled beer. Usually the pro-am of any golf tournament is just a way for local dignitaries to bring in high flying, no-name customers for a chance to play with a pro. The Phoenix Open, however, attracts top sports stars, business CEO’s and entertainment celebrities. We could tell when the week of The Open is occurring even if we didn’t have a calendar – an average of 75 private jets fly over our house into Scottsdale airport every day of the Open. There are so many planes at the airport that they have to double-park them. This year the pro-am was spiced up by the addition of a streaker! Yep – a 24 year-old man was breakdancing, practicing his golf swing and throwing sand up in the air while au naturel. Apparently he also fell down a lot and, not surprisingly, was eventually charged with disorderly conduct. What makes the story more amusing is that his antics went on for five minutes before anyone came out to stop him and at the end of his “performance” the crowd gave him a standing ovation. Again, not your usual stodgy golf patronage. Of course, what defines the Phoenix Open is the 16th Hole – the biggest outdoor bar in the world. Over the years it has gone from having a few corporate tents around the tee box to its current three-story stadium surrounding the entire hole. It is now literally like entering the lion’s den. The 16th hole is famous for caddy-races (now banned after one too many accidents), pros throwing items into the stands (also now banned) and for the rowdiness of the spectators. What other golf tournament sells tee shirts that says “Bring the Noise”? There are students from ASU that strive to get the front row seats on Saturday each year and from that vantage point, sing or shout a personalized message to each golfer. A few years ago the TV golf announcers were marveling at the amount of research this group does, digging up fight songs from obscure alma maters to knowing the name of the pro’s first wife. I suppose the students’ parents might be wishing that amount of analyzing was spent on studying microbiology or something but for the rest of us it’s pretty entertaining to hear their songs and heckles – as long as it’s not mid-swing. The upside of putting up with traffic and yahoos who yell “You Da Man!” is that the local charities benefit greatly from the tournament proceeds. In fact, that’s one of the best aspects of the tournament. As my neighbor observed, it’s also good that we can watch it on TV and miss the drunks vomiting into the trash cans. Starting today we can relax until Spring Training starts when, once again, our roads are clogged and restaurants are filled to capacity. Thankfully, baseball fans seem to be much more sedate than the Phoenix Open attendees. Hopefully no one comes up with the bright idea to build a bar on third base.